Picture dreaming. Floating. You are light as a feather. You are a feather. You are riding a feather. Gently. Soft, softly. Like being asleep in a feather bed. Like sleeping on a cloud. You move. You float. You glide. All is graceful. And then a shape in the dimness ahead solidifies into a 5 meter white spotted whale shark. And there is no panic, no shortness of breath. There is only the slow rhythmic sound of the air in your snorkel and this serene shape gliding by. All is incredibly peaceful. Like a dream. Only this is no dream. 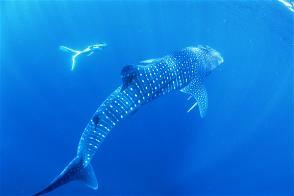 I am in a wetsuit, in snorkel, mask and fins, outside the reef, and I am facing a 5 meter male whale shark. As I breathe and absorb the grace with which he moves through the water, a part of me is desperately trying to hold onto the image and the feeling. I want to go to sleep with this. I would be happy to drift away at the end of my life with this. What an incredible living meditation. 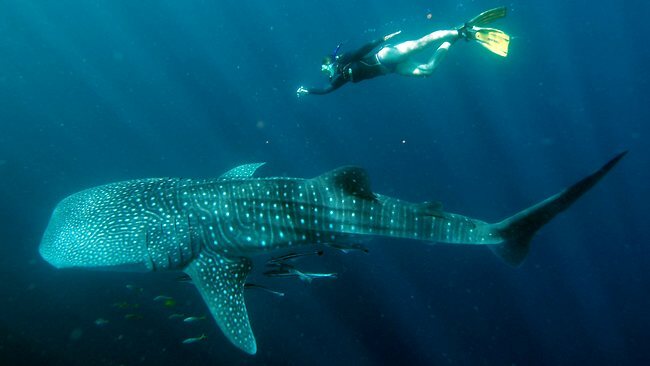 This entry was posted in Australia, travel, whale sharks and tagged Exmouth, Western Australia, whale sharks. Bookmark the permalink. YOU SAW WHALE SHARKS! Awesome! Pictures?! Unfortunately I was probably the only person without a go-pro. I took pictures with my heart. Actually my friend may have gotten some footage. I will ask her.